Having had many wonderful ideas for products & services this year, we brought them all to Dragon’s Den Stage. Following tough competition we decided to start up our business in researching, creating, marketing & selling bath bombs. We are the “Fun Fizzies” Bath Bomb Company. 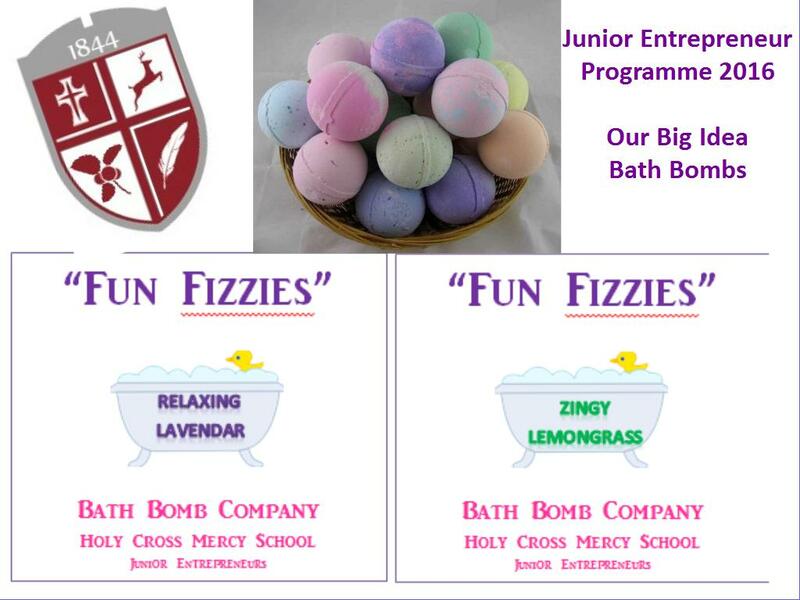 All of our products are made in a hygenic environment by our 44 Junior Entrepreneurs from the 5th & 6th Classes. Instructions: Our bath bombs work best in warm to hot water baths. 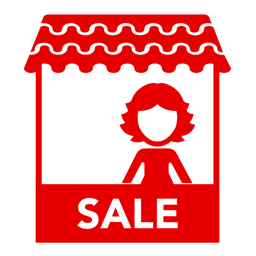 As a precaution, we advise our customers to rinse out their bath with warm water following the use of any bath bomb. Thank you. Ingredients: Bread Soda, Citric Acid, Cornflour, Epsom Salts, Olive Oil, Essential Oils (lavander / lemongrass) Food Colour & Water. Our company accepts no responsibility for allergens. In late January 37 Fifth Class pupils from Holy Cross Mercy School learned about what it is to be an entrepreneur. This was part of the Junior Entrepreneur Programme as supported by IT Tralee. Breda O Dwyer of JEP complimented the children on their work so far and on Tuesday, April 5th Jerry Clifford of IT Tralee raised the Junior Entrepreneur Flag at the school. Mayor of Killarney, Donal O Grady praised the children, their teachers, Miss Rhonda Daly and Miss Máiréad Finnegan, and Principal of the school, Mrs. Ursula Coffey for the children’s fruitful entrepreneurial efforts. They learned about entrepreneurial skills and had visits from local entrepreneurs Lisa Kerfoot and Derek George who told them all about how to start up a business of their own. The children then came up with several enterprising ideas and presented them to the “Dragons” in a Dragon’s Den style event. 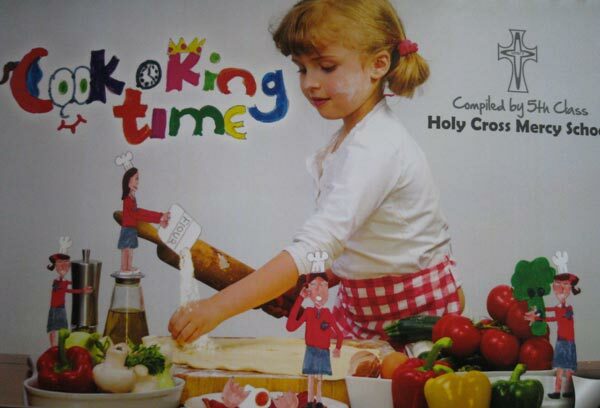 They then voted for their favourite idea which was a cookbook, “Cook-King Time”. They were then divided into different teams to work on designing, producing, marketing and selling their product. The girls conducted market research among the school community and gathered a selection of recipes from various sources. Recipes included dishes from parents, family members, local chefs and the Bishop of Kerry. The children designed the book completely on their own and typed up over a hundred recipes for the cookbook. They drew pictures for the cover and took them to graphic designer Damien Switzer who perfected their design. They contracted the printing of the book to Barry Murphy of Murphy Print who was most helpful. The pupils would like to thank the very generous Board of Management of the school who provided the seed capital to them to start their business. They also want to thank all who contributed recipes and their valued customers to date. The students have had great success since the launch of their cookbook having sold over 500 copies already and plan to re-invest some of their profit back into their business. Their involvement in the Junior Entrepreneur Project has been a very exciting and worthwhile experience. We wish them success in their future ventures in the business world.